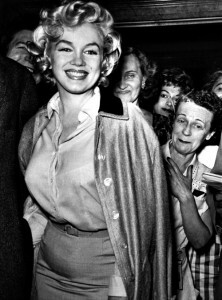 An auction pertaining to ‘the lost archive of Marilyn Monroe’ at Julien’s this weekend saw high bids on love letters between Marilyn and her husbands, as well as a cape worn to a press conference at New York’s Plaza Hotel, and a favourite silk coat, Harold Mandel reports for the Examiner. “A love letter which Joe DiMaggio sent to Monroe after she said she was going to divorce him went for $78,125. Another love letter to Monroe which was from Arthur Miller took in $43,750. A black velvet opera coat of Monroe’s went for $93,760 and one of her beautiful pendant necklaces went for $34,375. A white lacy Monroe brassiere sold for $20,000 and her small lip brush went for $10,000 while a makeup compact sold for $46,875. Her silk coat was the biggest ticket selling for $175,000.